Happy Friday Eve, Dolls! This week is flying by which is a-ok by me! Bring on the weekend. Today I thought I'd highlight one of my favorite summer accessories, a fun clutch. With so many pretty and colorful clutches out there, I had a hard time narrowing down my favorites. C. Wonder and J. Crew are my go-to places for clutches. I know I can always count on them for colorful accessories. Not to mention, they provide great inspiration for what to look for at lower cost retailers such as Target. I don't know about you but I will take one of each! Have a beautiful Thursday, friends. I'll see you back here tomorrow for Fashion Friday! How cute is that cork one? Love it! 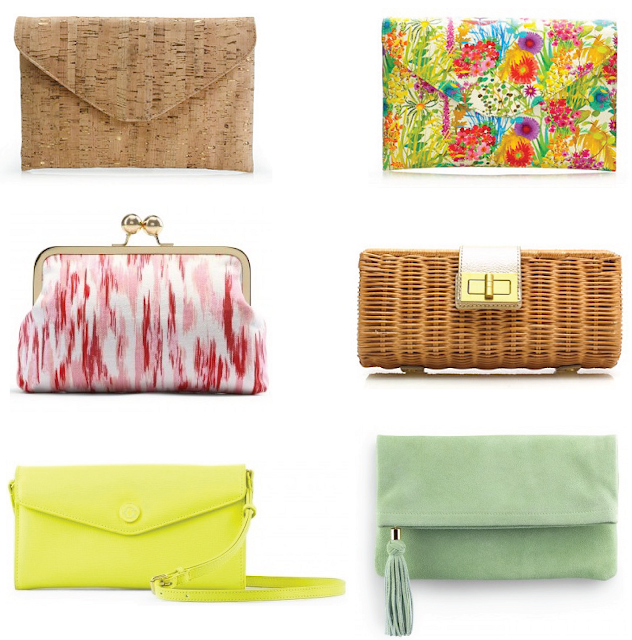 Love both the straw and ikat clutches!! You always find the best accessories!! Have a great Thursday friend! Oh my gosh...I LOVE them all! But I think the mint one might be my fav...it needs to be mine now! i think i like the mint green one the best! !